Hey there. I'm pretty excited about the Super Spartan Race that I will be taking part in this January. Yeah... I signed up well in advance to make sure that I will be at the best physical shape I possibly can! I decided to start doing a few runs this year. I participated in some light running (The Color Run) and I was fortunate enough to be invited to participate in the challenging Hero Rush. Now, from what I hear, the Spartan Race is one of the more challenging obstacle courses out there. I was persuaded to sign up by a cousin of mine and to be honest, I think it's one of the better choices I have made this year. I have increased my workout load and I'm feeling pretty damn good about myself. Have you done anything like the Spartan Race? Do you plan to? 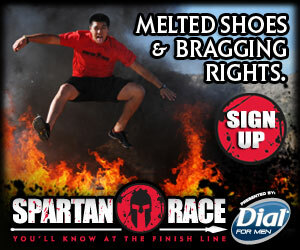 If so, make sure you sign up by clicking the banner and use promo code SPARTAN10 to get $10 off registration! Do it, friends. Conquer Sparta with me and rise up to the challenge! I'm getting pretty excited about it and it's still months away before the race is in Southern California. But there are many races held throughout the country so make sure you check it out and find the race closest to you! So are you ready to conquer Sparta with me? Later!